KUCHING: Sarawak has gone all out in its preparations for the 2016 Malaysia Games (Sukma), leaving no stone unturned in its bid to emerge overall champions. Social Development Minister Tan Sri William Mawan Ikom said with less than a year to go before the state plays host to the national meet, Sarawak has shifted to top gear to ensure preparations in all aspects are of top quality. The senior minister envisioned for the state to not only win Sukma 2016 but also able to become the best host offering first class venues, facilities, technical organising and services. “Technical preparations including venues, facilities and talents must all be polished and in top quality by now. Whatever lacking, especially in terms of our athletes preparation, must be finalised. “We will have trial runs in all aspects on our venues and facilities including athletes and coaches to see their level of preparation. “Everything must be first class including the systems at our venues. “We have spent hundreds of millions in our preparations as host and we can’t be petty about everything. We want the best and we want to win,” Mawan told reporters after officiating at the 2015 annual grant presentation ceremony at the Youth and Sports Complex here yesterday. 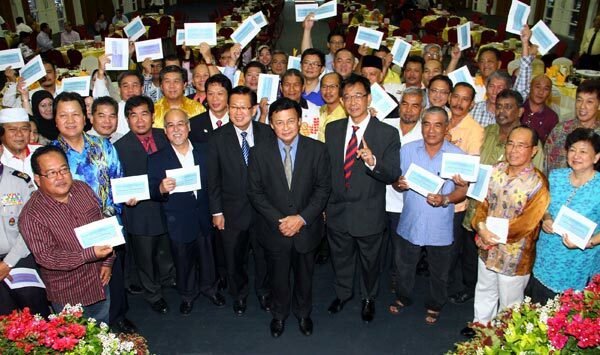 At the event, he presented grants amounting to RM5,251,600 to 53 sports associations and six organisations under the ministry’s Youth section purview. Also present were Assistant Minister of Sports Datuk Lee Kim Shin and Assistant Youth Development Minister (Urban Areas) Datuk Abdul Karim Rahman Hamzah. Mawan added that Lee, as the minister in-charge of the state Sukma 2016 preparations, will be meeting all participating sports associations to discuss and get updates on their level of preparation. The state is looking to find out first hand all problems and issues. Mawan mentioned that all venues have been upgraded including those in Miri and Sibu. He was also confident in the state’s chances to become overall champions, explaining that everyone involved are now more aware on the strategies and preparations needed to win. He also cited history as another motivating factor, referring to Sarawak’s 1990 triumph when playing host. That year, the state won 43 gold, 17 silver and 17 bronze medals. “In terms of the overall preparation for the state’s performance in the Sukma next year, we are very confident. This time around, we are more aware how other states became champions and what contributed to us falling short in the previous Malaysia Games. There are some strategies that we are finalising. Improving our talents is one of the top priorities,” he continued. At the Perlis Sukma last year, Sarawak collected 46 gold, 32 silver and 35 bronze medals to finish third behind overall champion the Federal Territory and Terengganu.